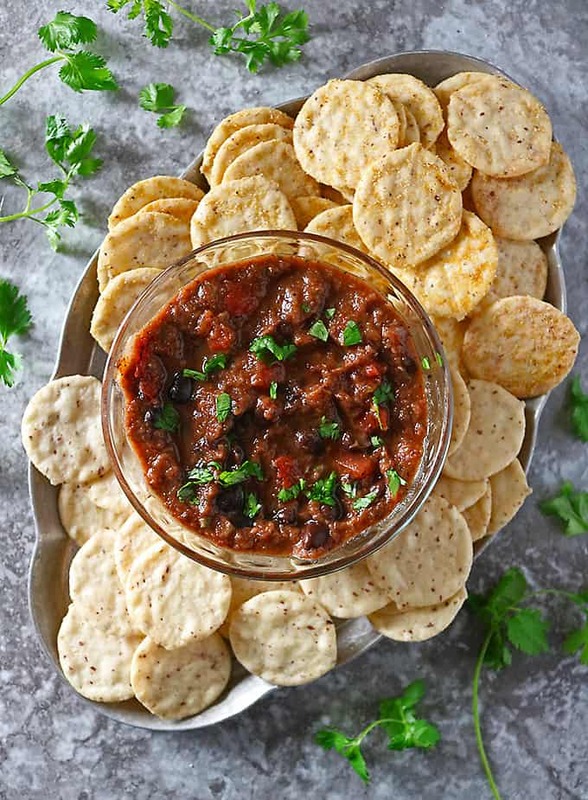 With just 6 ingredients – this is one delicious, vegan, Black Bean Dip that is a healthy option for your family and friends at your next gathering! 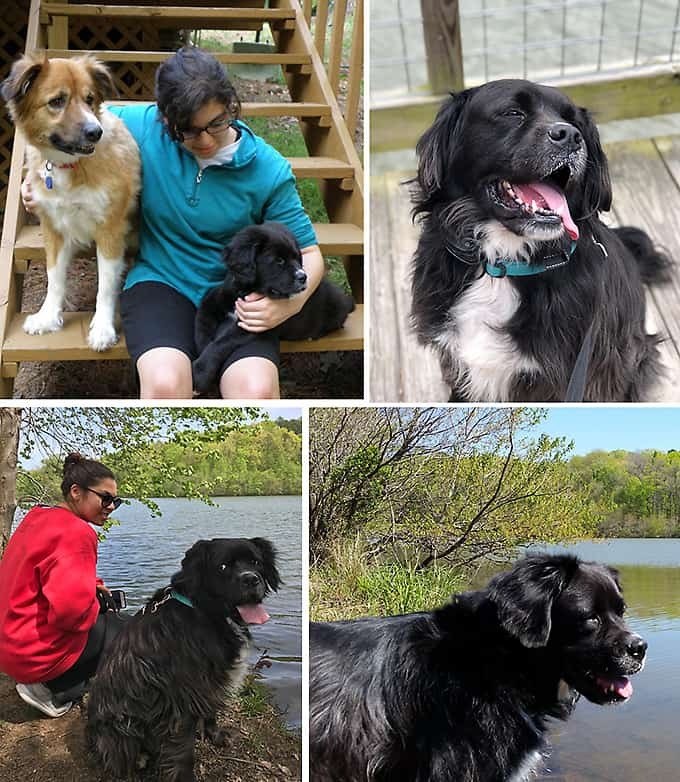 Last night my daughter and I were snacking on Blue Diamond® Nut-Thins and this 6 Ingredient Black Bean Dip, while trying to figure out how old our dog, Oliver, really was.You see, for the past 3 years my daughter has had us celebrating his 3rd birthday. But, I had to know exactly how old our always sassy, playful, tv-watching, Oliver was. While my daughter tried to convince me (yet again) that he was 3, I ended up turning to Facebook memories for the facts. And, FB told me that Ollie came into our lives 6 years and 3 months ago, at a little over a month old – where’d the time go??? He had been part of a litter of 3 that had been abandoned at a park. Someone else had adopted his 2 sisters, but he was left behind. He connected instantly with my daughter. And, I, very, very reluctantly agreed to bring him home with the condition that she would be in charge of him. And, in charge of him she was. She trained him, cleaned up his many messes, doted on him and even started an Instagram Page for him. And, as much as I didn’t want to, I ended up loving that dog more than I thought possible. These days, our lives wouldn’t be the same without his “comments” at the tv or people walking along the stairs outside our condo. And, we share the same love language – the love language of food, that is. Yes, yes, I know it isn’t one of the five love languages – but, around here, we luuurrrrvvve food! Eating it and making it and eating it and maybe sharing it and eating it …FOOD is such a beautiful thing to us. And speaking of foods we love, Blue Diamond® Nut-Thins have been a pantry staple since they came into our lives in the summer of 2015. In addition to snacking on them straight out of the package, back then, I also used them to make these delicious turkey burgers! These days, we usually stock up on a couple of flavors of Blue Diamond® Nut-Thins when we are at Kroger. 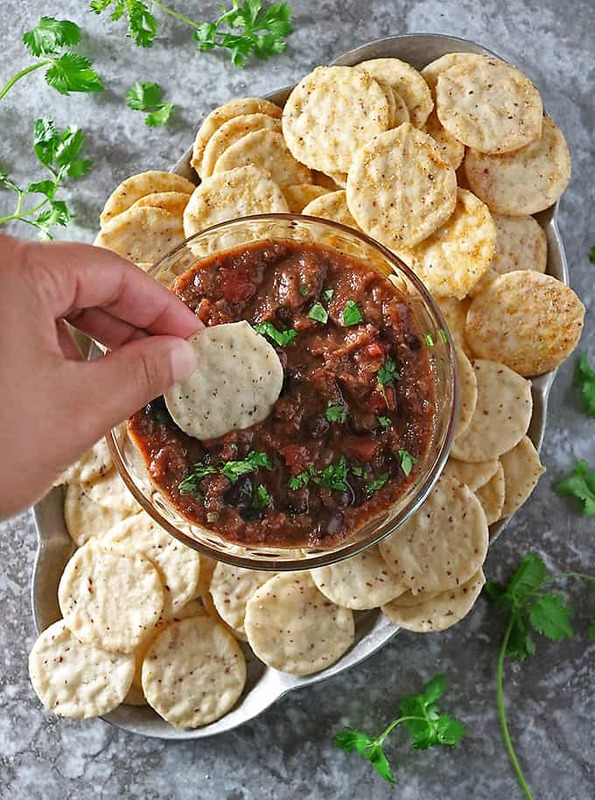 And, in addition to snacking on them straight out of the package, we also pair them with some of our favorite dips like this easy 6 Ingredient Black Bean Dip! 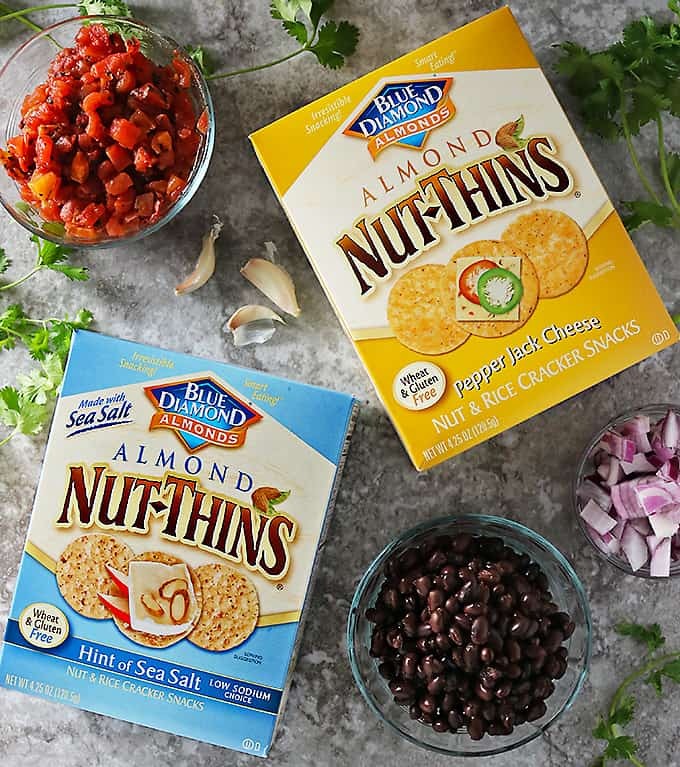 To my daughter and I, Blue Diamond® Nut-Thins are a delightfully delicious snack that is crunchy and crispy like a potato chip, but sturdy enough for dips and toppings. They are made with Real Blue Diamond® Almonds, contain no artificial flavors, and are wheat & gluten Free! in the Nut-Thins 2 Win Scavenger Hunt and Nut-Thins 2 Win Sweepstakes! Now, back to this 6-Ingredient Black Bean Dip! With just onion, garlic, fire roasted tomatoes, cilantro, smoked paprika and black beans, this is one healthy, vegan, dip. Now, if you are looking to add just another layer of flavor, just use some caramelized onion instead of the raw onion I used. 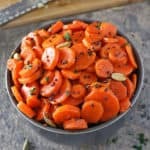 But, if you are short on time and looking for a healthier dip to enjoy, whip this up with the raw onion and serve it at your next get together! I’m hoping you and your friends and family will enjoy it as much as we have! With just 6 ingredients - this is one delicious, vegan, black bean dip that is a healthy option for your family and friends at your next gathering! After rinsing and draining the black beans, add them to a blender or food processor - but make sure to save just a handful to add to dip afterwards. 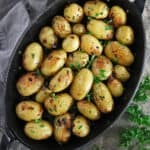 Also add in the red onion, garlic cloves, cilantro, smoked paprika and well drained, fire roasted tomatoes - make sure to reserve a tablespoon or two of the fire roasted tomatoes. Pulse blender or food processor till ingredients are well blended. I stopped my blender when the ingredients were a bit chunky - but, if you would like a more creamy/puree type consistency, then blend till it is reached. 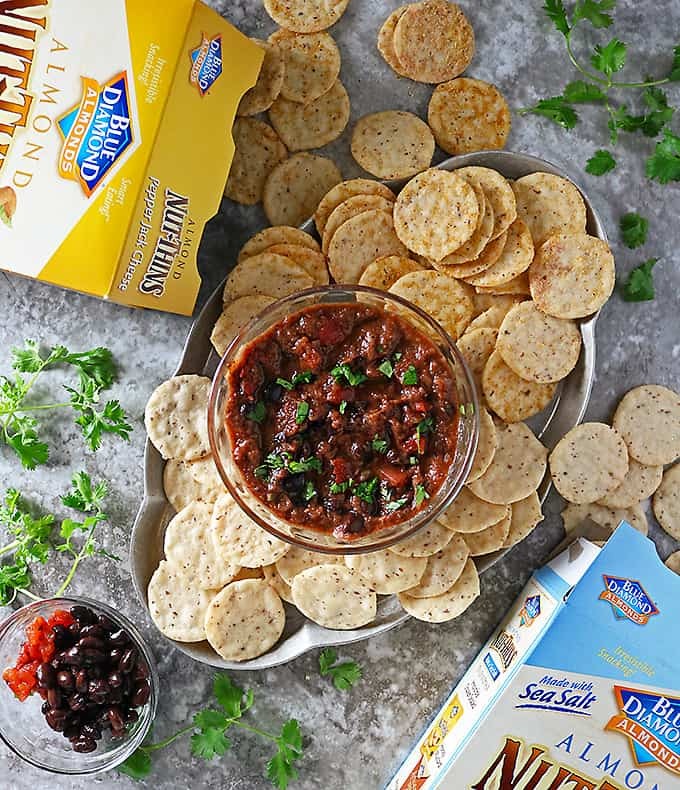 Add in the remaining black beans and fire roasted tomatoes, season with salt and pepper to taste and garnish with a bit of cilantro and serve with Blue Diamond® Nut-Thins. Make sure you are following Blue Diamond® on Instagram and Facebook so you will be the first to know of any upcoming promos and recipe inspiration! 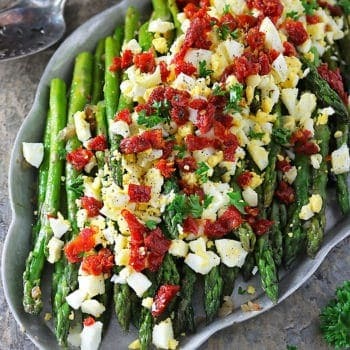 This is a great appetizer recipe but I really loved hearing about your daughter and her dog. Such a sweet story! 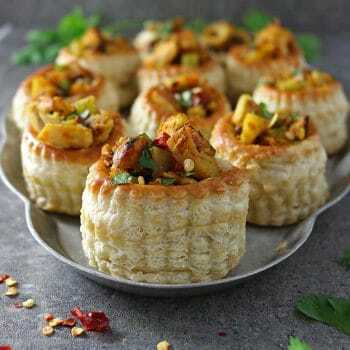 This is a perfect appetizer that’s also healthy, which is so rare! I too loved hearing about your dog! And who says food can’t be the sixth love language? Sweet story, and delicious appetizer that is perfect for any occasion! I love these nut thins, buy them all the time. 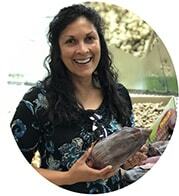 Now I have to try this black bean dip. It looks amazing! That’s a right decision to bring the dog home, Shashi. Look at your daughter, she is so happy 🙂 So is the Oliver. The dip looks wonderfully delicious! 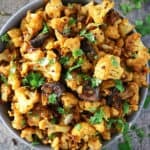 This recipe looks super delicious! 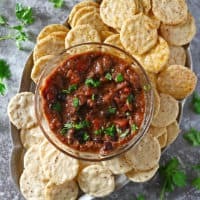 The nut-thins look so crunchy and flavourful and the bean dip is perfect to go with it. Love reading your story about Oliver and your daughter too. Facebook memories are amazing, aren’t they! Every once in a while something pops up and just makes me stop and say ‘woah.’ Ollie really is one lucky pup…or should I say Lil Shashi is one lucky girl! It’s a win-win, and I love the story of how Ollie came into your lives. Give him a pet for me! Now switching gears to this dip, it sounds amazing! 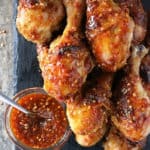 I love smoked paprika in dips, and this one looks delicious and easy, too. And we love those Nut Thins! They’re a pantry staple around here, too. Thanks for sharing, Shashi!